In Diag.1, △P-45 is also possible instead of △P-36. 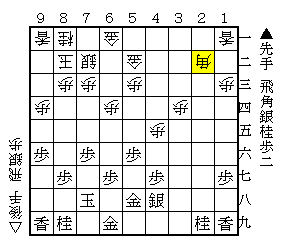 It used to be written in strategy books that △P-45 was not good because sente's silver could advance to 35 automatically taking a pawn. But, thinking of this position based on modern strategy, I suppose it's still a very close game. After △P-45 ▲Bx33+ △Sx ▲Sx35 (Diag.2), gote has two ways to counterattack. Continuing with ▲P-24 △Px ▲Sx △Sx ▲Rx, gote here responds △B*33 ▲Rx21+ △R-22 ▲+Rx △Bx (Diag.3) as the variation of △P-36 in Diag.1. Compared with the variation of △P-36 (Diag.4), gote has one pawn less in hand and the place of the pawn on the 3rd file is different. The pawn on 36 is better than on 34 in that the knight on 29 can not jump. Therefore, it seems like gote is not good at Diag.3. But, actually, I think it's by no means easy for sente to win. ▲B*55 △Bx ▲Px △R*28 ▲N-37 △S*49 is the one of the variations from Diag.3, which becomes a close game. ▲S*77 △R*28 ▲N-37 △S*49 is also considered. 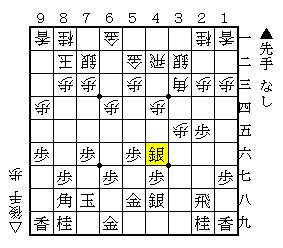 △S-44 is the move which was not seen when Yamada Joseki had been the fashion. 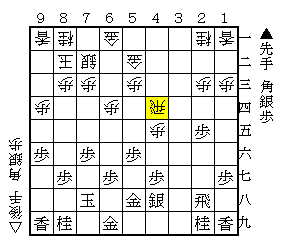 The similar move appeared afterwards in the variations of Fujii System. If silver run to 34, with △S-35, it's possible to protect the 2nd file. In Diag.5, sente has several ways to attack. ▲B*55, ▲B*22, ▲R-38 and so on. After ▲B*55 or ▲B*22, it would proceed with △R-34 ▲Bx11+ △S*39 ▲L*38 △Sx28+ ▲Lx34 (Diag.6). It's an even position. I think gote is easy to win relatively though, because gote's castle is stronger than sente's. When ▲B*22, the proceeding like △B*33 ▲Bx △Nx ▲R-38 △P*32 is also considered. There are a lot of variations here. Congratulations with a nice win today! This move K58 is not mentioned in any of the manuals I have, but I noticed it has been played in quite some top games recently. Its a new idea? What is the general concepts? Sente is aiming for a quick attack? Thank you. I could win with the help of the Ponanza. 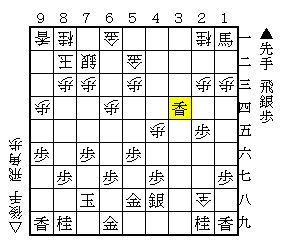 K58 is called Aono Style because 9-Dan Aono has played this move in many official games. And recently other players also have adopted. The general concepts of this move is to play P36, N37, N45 remaining the rook on 34. 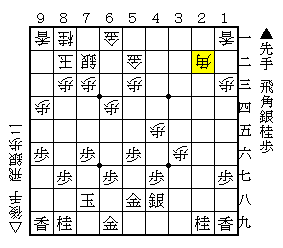 In some cases, sente uses the left knight also like N77, N65 for attaking the point 53. Actually congrats on winning the tournament! 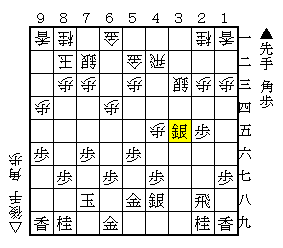 I wish it was around a few years ago when I first started getting interested in Shogi. Got back recently, and found this treasure trove. Was sad to see this series cut off in the middle though. In the beginning, you were talking about the countermeasure against 4th file rook, and said you'll go over yamada's joseki first. I am sad to see this series stop before you got to the actual idea you mentioned in the beginning, especially since it's almost impossible to find information on this. I mean, fujii system is mentioned here and there as a method to stop static rook side anaguma, but details on it are very rare, and I've found nowhere to show and explain how to reach anaguma anyway if at all... (which is what you were implying in the first article. Sad to see this end in the middle. Still, thanks for a great blog!